You open your eyes when you wake up in the morning and the first harmful chemicals you encounter are in the very air that you breath and on the very clothes and bedding touching your skin. You walk to the bathroom (on a floor coated in chemicals) to brush your teeth with toothpaste stacked full of chemicals. Don’t though. Seriously stay with me! I know its a lot to take in when you start to look at toxins and it took me a while to get over the denial, followed by my initial disliking of crunchy people, followed by intense thinking about the validity of the situation and some more, followed by my plan of action to live healthier, which can be easy if someone just tells you what to use rather than you having to go through lots of products that cost lots of money to get to the products that won’t foam in your mouth or stick to your gums. Yes, those are words coming from first hand experience!! I’ll give you a list of just some of the dangerous chemicals found in your every day household products and toiletries just to get it out there just how harmful they can be… Don’t worry though, I will soon give you the list of ALTERNATIVES you can choose from the comfort of your home without having to find a health shop near (or far). We would all like to have a safer and better bathroom. This is the list of alternative products I use to make sure I don’t bring any of these dangerous chemicals into my house. In general I make sure I order the worth of R350 or more, which is about every month or two, because delivery is free when you order R350 or more. I have a standing list on my phone where I write down when any bottle gets to 1/4 left and when there’s enough products to make up R350, I order. I must admit sometimes I have an emergency when something runs out before I have enough products then I buy the needed alternative product from my local grocery store but honestly I find those products icky these days! I am so used to fresh smelling products with soft textures that the sharp smelling products with thick gooey textures has become less likable for me! Why I love The Lorax so Much! 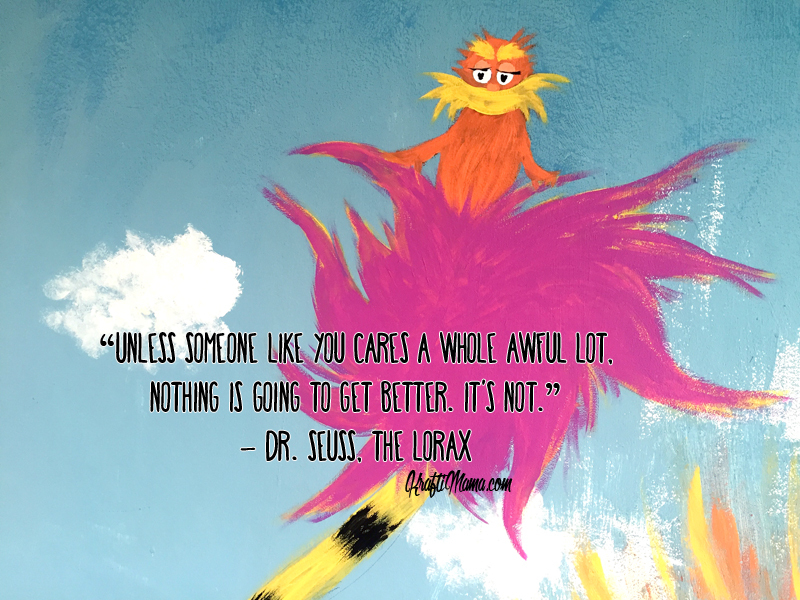 There is so much to learn from most of the Dr. Seuss books, but The Lorax… Oh the Lorax! For a three year old to have an understanding of the environment like that, all you need is Dr. Seuss! South Africans can buy it from Takealot, American friends, have a look at Amazon. To download the quote, click on the image below. Competition Time!!! Win A Mother’s Day Gift Pack from be.loved! Brand new manufacturer of ALL NATURAL handmade body care products be.loved is giving away an awesome Mother’s Day Gift Pack worth R165!! I just love this roll on and really wish it didn’t melt in summer! Some people store it in their fridge once the weather gets warmer but I prefer to buy natural roll-on in summer. Initially the ingredients is a little costly but once you have it, it lasts for very long and you have multiple uses for every ingredient so you save a lot of money in the long run. Place 3T Virgin Coconut Oil, 2T pure Shea butter in a small metal cup over a bowl of hot water. When oils are melted, add 3T bicarbonate of Soda and 2T arrow root, 5 drops each of lavender, tea tree and lemongrass essential oils into the oil mix. Stir well to combine. Pour oil mixture into an empty deodorant stick container and allow to cool. Just make sure you cover the base well with something like a cut up lid of an ice cream container or something so it won’t leak. I used a Dove roll on container and mine did not leak but my container can also just be filled half way… Im sure most of them use this trick though. If you dont like the consistency once it sets, you can easily melt it again and play around with different proportions of oils for firmer consistency. Whatever is left over I pour into silicone mini muffin cups and just add the desired amount to my re-used deodorant container every month. I usually use 2 mini muffin moulded sticks to fill up and I usually get about 3 deodorant sticks out of it. It sounds complicated but once you get the hang of it, its really very convenient. Mix 1,5kg washing soda (You can buy Soda ash in pool sections or see my recipe below) with 2kg Bicarb and 1kg Epson Salts. You may want to divide that beforehand into two bowls to be able to mix it if you don’t have one very large bowl. Store in a bucket until needed. From this take 2 cups and add enough lemon juice to make it sticky and clumping. Fill ice cube trays and push down with gloves or cover with cling wrap because it is very drying on your hands. Leave in the sun for a day or two to dry out. It is ready when you can pop it out of the tray without it breaking. You can use the powder as it is as well. Can add citric acid as well. Use salt as normal and Vinegar as rinsing aid. For 1,5 kg washig soda. Spread 2kg bicarb in a thin layer over baking trays. Bake at 200 degrees celcius for 1h-1h30. Bicarb is fluffy and shiny. When it is ready, the washing soda is dull and grainy. Use recipe for Dishwasher Pods above but leave it in powder form without adding lemon juice. For softener I use half a cup of Vinegar in a large load and add 10 drops of essential oil for a bit of fragrance. Its not as soft and doesn’t smell as good as store bought conventional softener but it does the trick and I am willing to sacrifice as much for the environment. There are natural softeners available but I found them quite expensive. Slowly Whisk the wet ingredients into the dry mix. If it starts to fizz, add dry ingredient to stop fizzing. Start adding some food coloring. Final consistency should be like slightly damp sand and squish in hands without crumbling. Stack and pack silicone moulds with the damp sandy mixture, or roll your own balls. Press out and wrap them in rows in paper towel to collect excess water otherwise they will fizz out. If they still swell out and look too disfigured you can always make them in balls at this stage… At least they will all be the same size. Put them in an airtight container with a paper towel inside in the shade for a few days to dry out. Just add one to two tablespoons of your natural conditioner to an empty used spray bottle and top up with warm water. Remember boiled water melts plastic bottles and leave enough space to shake. Start at the bottom when combing hair and spray on sections before combing through. If the hair seems oily or sticky you used too much for your particular conditioner… Just throw some out and top up with water again. That it for now… keep in touch for more updates! A few of you have asked me after I wrote this post to give you ideas for alternative products. Believe it or not… it was actually going to be my next post. So here goes… the long awaited list of alternatives I use. It makes your life easier?? ?